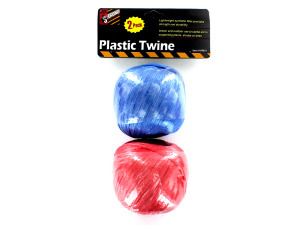 This plastic twine set is a great value pack. Each set comes with 2 rolls of colored twine. Twin is lightweight and made of synthetic fiber with heavy duty strength. Great for both indoor or outdoor use. Comes in assorted colors. Both rolls are packaged in a poly bag with header card. Each roll contains at least 80' of twine.